Cash Register Reviews Recently Reviewed! Pros: -It allows the user to configure the POS system according to the needs of the business without having to rely on a programmer or on tech support. That means less downtime for the business because the business owner does not need to schedule a programmer to do the setting up of the POS system. -Any user who can read and understand basic instructions can actually set it up. The features of each function has explanations on what it is for (on the same screen), how the settings affect the user, and how to configure each function. The user can make the system as simple or as robust as he wants it to be. The most basic step is just to input the items and the prices and you can already have a working POS system. -I do not encounter runtime errors which perhaps is due to the fact that it is DOS-based unlike if the software runs on some other programming languages. -It could be configured in one computer and then installed on another by just copying and pasting the whole POS folder in a USB or via a network. a. You can set it up to compute for discounts for specific people (e.g. senior citizens) or during promotional sales. b. You can maintain, add, and monitor inventories. c. You can set up access levels through the setting up of passwords for different functionalities. d. It can actually print on receipt printers, open cash registers and utilize pole displays. Cons: I'm actually looking for a way for the cashier to input the cash on hand in the system before the cash register totals are displayed so we can check if the actual cash is over or short from the POS register totals. What we do now is a workaround. The cashier inputs the cash on hand in the POS system and another person closes the cash register and declares if the actual cash is over or short from the POS totals. Also you can't use a mouse on it since it is DOS-based. However, it displays what you need to press in the keyboard to do transactions. 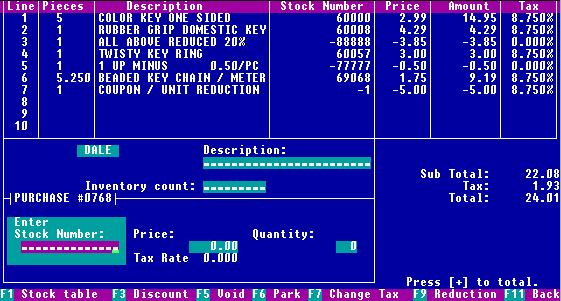 Overall: Overall, I am happy with the Cash Register software. Even if it is free, it can rival other software that charges a fee for its use. It has functionalities that other expensive software offers. It can basically run any business whether it is heavy on inventories or services. It is configurable by the user himself. It is user-friendly and easy to set-up. It can monitor sales (per hour, per day, per item, etc. ), track and update inventories and even customers if the business requires, and set up user limits. We have used it before in a computer rental business. We are using it now for our milk tea business. It can be a useful tool in any business, I think. Pros: It is heartening that this package is completely free when many POS applications are painfully expensive for small businesses on a tight budget. But, even if it had instead been a paid product, nothing quite measures up to DHPOS (otherwise known as Cash Register) for rock-solid common sense, customisation and broad application to almost any small retail business that is happy to do without a graphical interface. Some may balk at using a DOS application for their day-to-day POS requirements -- and it is indeed a very classic DOS application written in QuickBasic 4.5 -- but it is both stable and reliable, as well as enjoying tremendous voluntary support from its creator. As it is a DOS application it will run on virtually any platform including 64-bit Windows, Linux and Mac OS courtesy of DOSBox and provides an advanced cash register, inventory manager, customer database and reports engine as its core functionality. Additionally it can provide ticket sales for theatre environments, a kitchen display for restaurants and bars, timed sales for Internet cafe type environments, and a variety of additional other features for innumerable business cases. It generates very detailed and useful reports that if used appropriately can be exactly what a small business needs to get control of its cashflow. All business operations in DHPOS follow a linear, step-by-step model which prevent errors from staff input and it requires very little staff training to use once set up. Cons: As it is a DOS program, there is no native support for many printers and barcode scanners directly from the program itself when run under Linux or Windows, so it can sometimes be tricky to make these devices behave themselves. There is a program called APRINT provided with the package for printing under Windows, although this can sometimes be a little tricky to configure correctly and does not always work. A workaround is available via the serial port emulation functionality of DOSBox which under Linux can be mapped to a physical device. This however is not a fault so much with the software as the environment in which it is developed, although given some persistence these issues can generally be overcome successfully. Overall: Whilst it may well be the case that many commercial and cloud-based POS packages have a nicer-looking user interface and require less setup and configuration, I have always been impressed with the rock-solid, "Swiss Army Knife" type approach that DHPOS takes. It is true that there is a little tinkering and thought necessary to get the software working the way that a client wants for initial setup, but once done nothing needs to be further altered and there are no ongoing costs to the client; it is literally like a physical cash register once set up. I still see some small businesses struggling with "dumb" cash register type tills that are clearly inadequate for their requirements where DHPOS can easily do a far better job, and for free, on literally any computer they have to hand even if it dates back to the late 1980s. This software could be a huge game changer for these businesses that could benefit from a more rigorous and careful analysis of their sales transactions. Above all, in terms of experience, I must say that the creator has proven to be an absolute gentleman to all of us in the DHPOS user community. Despite this being an unpaid role of his, and the software being free, quite amazingly he provides better support to all of us in using his software than many people get from paid POS support contracts. Pros: There were so many pros and it is hard to choose just one. The program itself is lightweight and can run on an older PC. I ended up using a Windows XP box, that was not connected to the internet, for this purpose. It will run on newer computers, for sure, but 64-bit versions of Microsoft Windows computers need a DOS program like DOSBox to allow it to work its magic. It works easily with my Star printer and bar code scanner. The cash drawer functionality was easy to program. In fact, another great thing about this program is that the author heavily documented how to set it up. Cons: Setting up another monitor as a pole display seemed to be the biggest challenge I had. A couple of e-mails between the author and myself, however, resolved the issue. Overall: When we first started our business, we got caught up with another vendor's Point-of-Sale system. Their software was expensive, clunky, slow, and difficult to use. After some frustration with the price scheme and the fact that they wanted another couple hundred dollars to upgrade so that it would fix their bugs, we looked around and found Dale Harris Point of Sale. To be honest, I didn't expect much simply because it was free. I was pleasantly surprised when it not only was fast and easy to use, but the setup and maintenance was simple. It not only won me over, but I later installed it for my in-laws who had a business of their own. They used it for about 10 years before they finally retired. Pros: I hate to say it, but the price is what I like most about this software. Our cooperatively operated gallery has a very low budget and we pinch pennies wherever we can. We operate in a small town in a remote area. So, we count on locals and hope for tourists to keep us operating. How can you beat free software? Cons: Although this is not a problem for me personally, I think it would be easier for some people to use it were it a Windows based program rather than DOS. We have 15 member artists who use the program during their twice a month gallery sitting gigs. It's sometimes challenging for technology-challenged artists to remember how to operate the program properly. Overall: Our gallery has been using this program since its inception in 2007. Other than a couple of hiccups early on, we have run it successfully. We've set up the system so that each artist has a vendor number and correspondingly numbered inventory items. It's easy for each of the artists to see their sales throughout the month. The gallery director pulls monthly data from the program to determine how much each artist is owed at the end of the month. Pros: Customer service is superb! Links for updates and faqs are great for us ludites that need a register. We've used this program for over 11 years now. Cons: Interface with windows has been a little problematic but has improved a lot. Pros: Very smiple to use and easy to understand. This program has everything that should be in a piece of pos software and more for 100% less cost. Pros: The incredible amount of settings and features. The support for all printers, barcode scanners, and pole displays. The retro look and feel of the software. The easy to use sales screen. The almost nonexistent loading times. The wide range of password protection features. Dale Harris and his sense of humor. Invoices are simple and customization options are limited. The beep noises sometimes don't work or get "stuck"
-Great stock table, ability to track stock cost and retail. - supported all my existing hardware. - easily watch sales remotely. Cons: My least favourite this about this is very minor. No way to customize colors. Although the current colors are easy on the eyes. Overall: Overall this cash register program/POS is simply amazing. I have no issues running it on a daily basis. Support is handled by the team (the brain behind the software). The team is always helpful and never makes you feel dumb even if you feel you are asking a dumb question. All in all had my pos up and running in 2 days. Could have been a day, but was doing a lot of testing remotely from my hardware. LOVE IT, LOVE IT, LOVE IT! Looking forward to seeing the 64bit version completed!